While there’s no shortage of adventure to be found on a Caribbean vacation, sometimes, the best activity is none at all. Kick back with a tropical cocktail at one of these six incredible Caribbean beach bars, where you can admire the ocean blues, enjoy refreshing island fare, and maybe even plant your feet in the sand. If wanderlust strikes, a Caribbean escape is only a Tradewind flight away. Anguilla resort Cap Juluca reopened in December 2018 as a new flagship Belmond property, and its reincarnation brought in a slew of incredible beachfront bars and restaurants. Our favorite: Cip by Cipriani’s, an offshoot of the Belmond Hotel Cipriani’s culinary hotspot in Venice. Grab a front row seat by the impossibly beautiful Maundays Bay, order a bottle of rosé and some classic Italian bites, and let the hours slip by. Eden Rock St Barths may not reopen until late 2019, but its fabulous new beach bar is already up and running — and buzzing. St. Barths’ legendary people watching, celebrity spying, and fashion spotting comes to life across St. Jean Bay, with a cold glass of fine French wine in hand. Enjoy the views on a high-top stool at the bar, or get cozy on a beach lounger. In rebuilding Le Sereno St. Barth after Hurricane Irma, the property added a new toes-in-the-sand beachfront restaurant, Plage. With prime views of Grand Cul de Sac bay, it has the kind of vibe that makes you want to stay a while. As the palm trees sway above, sip on a Sereno Spritz (June liqueur, freshly muddled raspberry, grapefruit juice, peach bitters, and prosecco), nibble on the red Sicilian prawn carpaccio, and take in every moment of the good life. When Hurricane Irma struck in 2017, she swallowed much of Sandy Island, which was home to an eponymous beach shack. But Sandy Island has resurfaced with a dreamy 360-degree beach, a rebuilt restaurant pavilion, and plenty of umbrella-capped beach beds for those languid beach days. 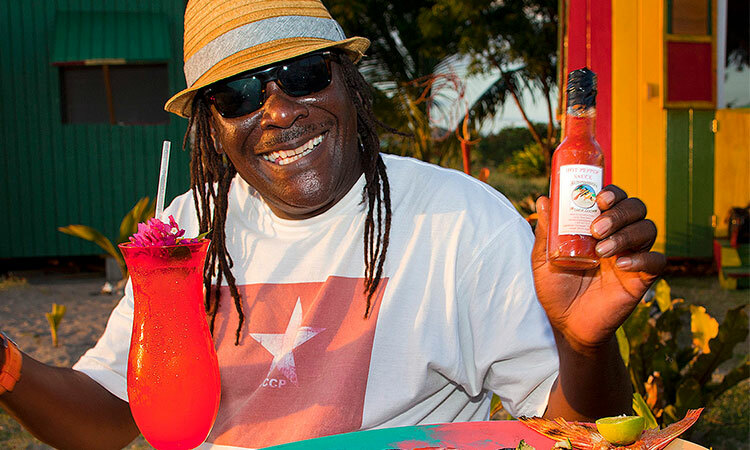 Order the “Crazy for Crayfish” — it’s the Anguillan delicacy in its best BBQ form — and wash it down with the secret-recipe JoJo Rum Punch. You can access this slice of paradise by private boat or the island’s daily water shuttle, which leaves from Sandy Ground Beach on the Anguilla mainland. Oh, and prepare for a wet landing (it’s part of the experience). No beach-bar hopping experience across the British Virgin Islands is complete without a stop at Soggy Dollar, a Jost Van Dyke icon. After all, this is where the “Painkiller” cocktail was born and perfected in the 1970s. Following a 2018 rebuild, it’s once again possible to enjoy this heady mix of premium dark rum, cream of coconut, pineapple, and orange juice (topped with fresh-grated Grenadian nutmeg) with local yachters. Though it’s situated right next to the gorgeous Four Seasons Resort Nevis, there’s nothing glamorous about Sunshine’s Beach Bar — and that’s exactly its charm. The brightly colored bar is low on frills and packed with local barflies, and it pumps out reggae music day and night while serving super-strong drinks that’ll knock you off your feet. For the true Sunshine’s experience, order the “Killer Bee” rum punch, which goes down way too easy and, as the name suggests, stings in the end. Sunshine’s is the kind of under-the-radar bar you’ll reminisce about long after your Caribbean vacation (at least, what you can recall). Tradewind Aviation offers regularly scheduled service to St. Barths, Anguilla, and Nevis and charter service to the British Virgin Islands. For today’s sophisticated businessperson, accessible air travel is a must. What many don’t realize, however, is that an enticing alternative to private jet transfer exists in the form of smaller turboprop planes, like Tradewind Aviation’s Pilatus PC-12. Since debuting in the airline market in 1991, the Swiss-made Pilatus PC-12 has gained a reputation for its reliability, performance, and versatility, combining the speed and air-pressurization of a King Air with the cabin space and short-field performance of a Grand Caravan. As travelers discover that the smaller aircraft is just as safe as larger planes (and often comes with a lower price tag), more and more are turning to turboprop charters as a part of their productive business strategy. “The Pilatus PC-12 offers the comfort and convenience of a private jet for significantly less cost, making it a smart business tool for short- and medium-range trips,” says Tradewind Vice President and Co-Owner David Zipkin. He also adds that the turboprop is ideal for stage lengths of up to 350 miles, such as Teterboro to Boston, Westchester to Toronto, Teterboro to Syracuse, or Westchester to Pittsburgh. For instance, travelers flying Tradewind’s charter option from Westchester Airport to Boston Logan International and back can expect to pay around $4,700 per day trip. Compare that to using commercial business class, where a similar journey from LaGuardia to Boston and back for eight people costs around $5,200—or to private jet travel—which can run upwards of $10,000 roundtrip. While Zipkin says that customers are often surprised by the lower costs they experience when choosing charter, they tend to be equally amazed by the amount of time they can save compared to commercial airlines, especially on shorter trips. Whereas jets are often subject to re-routing due to their higher airspeeds, he explains, turboprops are often able to fly more direct paths, resulting in the same or shorter travel times. Considering the ability to bypass TSA and arrive at the valet-ready tarmac just 10 minutes before a scheduled departure, customers can expect to shave off up to five hours per round trip. Keeping in mind that business doesn’t cease during travel, Pilatus PC-12s come equipped with plenty of privacy to conduct meetings in the air. Similar to its leisure flights, Tradewind’s business accommodations include comfortable air-conditioned cabins, leather seating, writing tables, and complimentary drinks and snacks, along with additional catering on request. 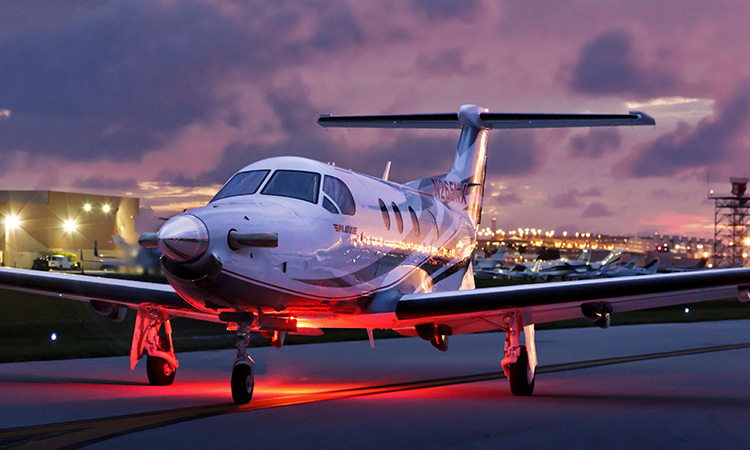 “Our clients who have flown the Pilatus on leisure trips have seen the efficiency first-hand, and many have started to apply the same benefits for their business trips,” says Zipkin, who expects Pilatus PC-12 business travel to continue its upward swing. Spanning 53 miles of pristine trails in Vermont’s Mad River Valley, Sugarbush is known as one of the top ski resorts in New England with good reason. The alpine retreat in Warren is home to more than 100 trails, a professional-level terrain park, and the spectacular, 2,000-acre backland woods area of Slide Brook Basin. Among the skiers and snowboarders taking in Vermont’s breathtaking scenery on any given day is Mark Woolley, Seasonal Programs Supervisor and Alpine Training Coordinator. Woolley has been at Sugarbush since 1979 when he moved to the mountain at the age of 21, and today, he still skis as much as possible during his free time. “It rivals anything in the East,” he says of the terrain, noting the marked trails as well as the much-acclaimed side-country and backcountry. At the heart of Sugarbush is the Lincoln Peak area, which includes Lincoln Peak, Castlerock, Gadd Peak, and North Lynx and features a variety of classic New England trails and the Ski & Ride School. Nearby in the Mt. Ellen area, composed of the 4,083-foot Mt. Ellen and Inverness, you can find Vermont’s highest chairlift. The marked trails in Lincoln Peak and Mt. Ellen are among the best in the region, offering incredible beginner and expert terrain — including Woolley’s personal favorite trail, the double-black Lift Line on Castlerock Peak. But it’s between the two areas that you will find Slide Brook Basin, which is where Woolley and many of the resort’s top skiers and riders spend their time. Beyond resort boundaries, the basin abounds with challenging expert ski terrain. It’s here that you can find tranquil backcountry solitude as you explore with your group — and perhaps even spot wildlife including moose, black bears, and white-tailed deer. Back in Lincoln Peak and Mt. Ellen, the terrain parks also attract skiers and riders of all skill levels. Families and beginners enjoy small jumps, rails, and boxes in the progression park in Lincoln Peak, while experienced skiers and riders head over to Mt. Ellen’s Riemergasse and Sugar Run via the Sunny Quad chairlift. Sugarbush’s premier park for more than a decade, Riemergasse is packed with more than 50 of the most advanced medium and large features in the industry, with an opportunity to link a single top-to-bottom run 15 features deep. Nearby, Sugar Run is a traditional top-to-bottom run with small and medium features that are great for those in the early stages of freestyle skiing and those who want to warm up before Riemergasse. Between hitting the slopes, there is plenty to do in the Mad River Valley, from shopping artisan galleries to grabbing a bite at top après ski bars to relaxing in Sugarbush’s cozy accommodations. For Woolley, some of the many great restaurants in the area include the Hyde Away, where you can find modern farm-to-table cuisine and Vermont microbrews, and The Reks for delicious appetizers and innovative comfort food. He is also known to visit the Mediterranean-inspired Sage on a Thursday night. At the resort itself, the retro-themed Wünderbar and Castlerock Pub with its extensive beer selection are both favorites for quick breaks and après ski stops. Woolley recommends eating midmorning and midafternoon when there’s a crowd at Sugarbush so you can have some runs all to yourself midday. From year to year, Sugarbush tends to see the most snow in March, but this season there has been plenty of snow all season long — including about five feet in January — so the mountain is in perfect condition for a winter or spring getaway. As in years past, the slopes will remain open until the first weekend of May. A quick flight from Boston and New York City, Sugarbush is completely accessible for quick getaways or weeklong retreats with Tradewind Aviation’s on-demand private charter flights. To reserve a charter, call us at 1-800-376-7922 or click here.